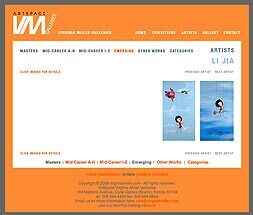 The paintings of Li Jia, whose work has been exhibited in the United Kingdom and the United States as well as in Shanghai and Beijing, are highly regarded in Chinese art circles: the “2007 Chinese Contemporary Art Document” gives her a full three pages and includes four half-page color illustrations. Two of the paintings shown in this prestigious book were featured in “Under the Radar,” the groundbreaking exhibition of contemporary Chinese works held at this galley from March through May 2008. In this series her anime-inspired subjects are young women with doll-like heads and provocative red dresses, dangling by slender threads as a marionette or tearfully swinging from them while seated on a thorny rose. Politically inclined viewers see the wilted red rose with its falling petals as a subconscious statement about a less-than-inspiring form of socialist government; romantics view them as a lament for a failed love.